Negative Ohm reading from a Electrochemical reaction? The purpose of my experiment is to determine which salt is the best electrolyte. The setup is a tarnished spoon (Ag2S) is placed on top of thin plastic pieces that separate it from a container coated with aluminum foil. A solution of 1.0 M Salt and .2 M baking soda is heated and then poured into the container. 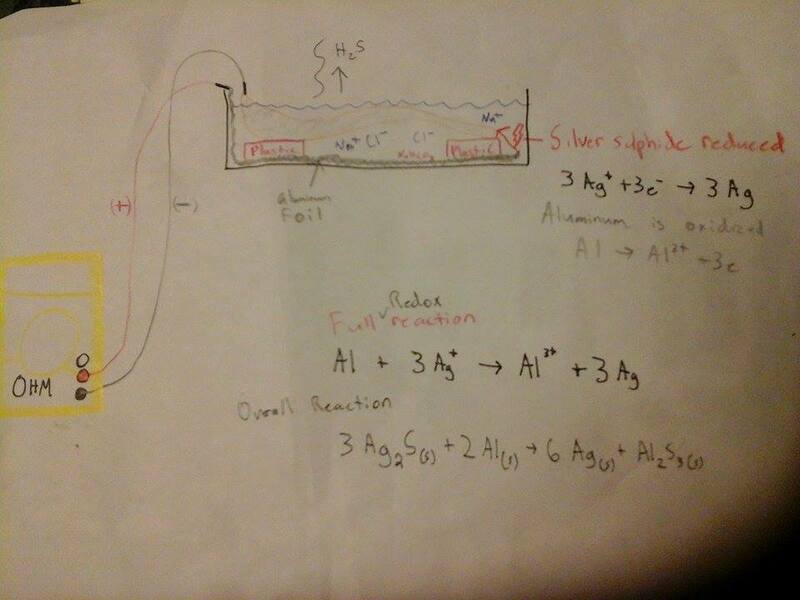 The following electrochemical takes place 3 Ag2S(s) + 2 Al(s) → 6 Ag(s) + Al2S3(s), the redox reaction being Al + 3 Ag+ → Al3+ + 3 Ag. A multi-meter set to 200 ohms is attached, the positive end to the foil, and the negative end to the spoon. The picture included is my set up. My logic was I could take the resistance measurement, take its reciprocal, and then find the conductance. I thought whichever salt would give me the best conductance would be the best electrolyte. However, I've only gotten readings of Negative ohms. My readings have been -190 ohms and then it steadily increased. The problem there can't be a negative conductance. From research I've found this, "conductivity is negative, it means that the resistance is negative, right ? This may occur if you have created a generator in your experiment, for example through a non-desired oxydoreduction phenomenon between two metals. If a current is produced in your experiment due to such reaction between 2 metals of different oxidation potentials, and if you material acts as en electrolyte, your apparatus may interpret it as a negative resistance." How could I use the negative Ohms reading? Should I be collecting data in a different way? Help! How could I use the negative Ohms reading? You're using the meter the wrong way. A meter is set up to have a particular low voltage and measures how much current flows. Since your electrochemical cell has a voltage and creates its own current the meter reading goes whacko. Should I be collecting data in a different way? If measure current that would give you some idea. In a better controlled analytical chemistry experiment a special electrode pair with two flat plates is used so that the geometric configuration stays exactly the same. Not the answer you're looking for? Browse other questions tagged physical-chemistry electrochemistry redox conductivity electricity or ask your own question. What gases would be produced from the electrolysis of distilled water and sodium bicarbonate? What is the effect of Helium-based surroundings (99% Helium) on electrochemical gas sensors? What does negative current reading in galvanic couple mean?